M31 or Andromeda is without a doubt one of the most imaged objects of the sky, and one I knew I had to come back and try to get an image that at least escaped mediocrity. For that reason I focused on capturing an image that would allow me to get as many details as possible from the bright core that otherwise it tends to be either oversaturated or simply too bright to discern any details. I'm very happy with the results - with a fairly modest equipment I was able to scrap details out of the core that other images taken with much more expensive telescopes simply do not show. The quality of the images used in this animation is not great. In particular the "slides" from Tony Hallas and Robert Gendler are at a much lower resolution than the original images from these two fine astrophotographers. The purpose of this animation is not to compare the QUALITY of the images, but only to verify whether the details in my image are real or artifacts - or both. Just because a particular image does not show more details in the core than another does NOT mean the image is of a lesser quality, not at all. 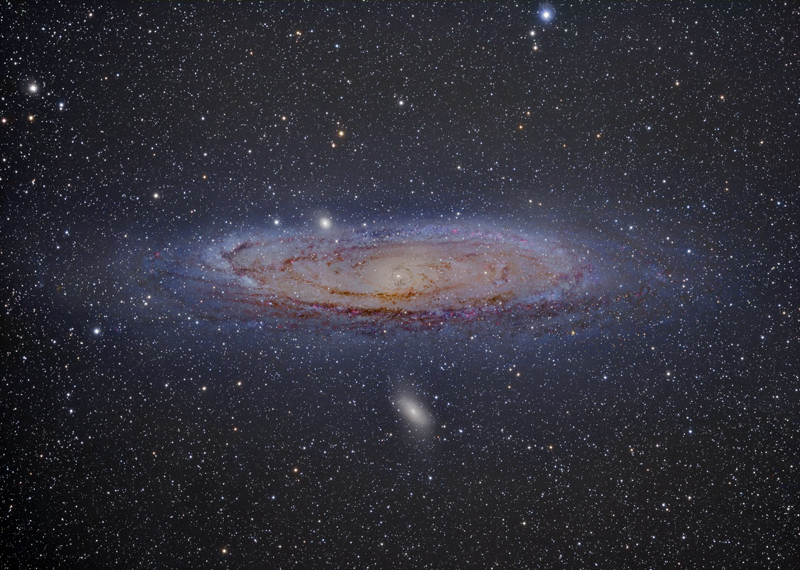 Different images will have different goals when imaging M31 (or any other target). Again, the only reason to post these images is verify if the details in mine are real, not a competition to see who revealed more or less details. To me, the most revealing comparison is the one with the image from Mark Jenkins and Roland Christen, and that's why I placed their "slide" right after the visualization of my image. While none of my images are subject to traditional copyright and instead use a Creative Commons License, because this animation uses images subject to copyright by their authors as indicated in the next bullet, copy or reproduction of this animation is not allowed. I was viewing your site. You get better year after year. * Simple: Because of your equipment. * Superb: Because of GALEX in UV and you in Visible. * Unbelievable: I simply can't. How, how did you? I mean: eeeexcelent work. You matched GALEX or the opposite? Great website, a constant progress in your astro-photographer ability. By the way congratulation for your 2009 September 29 APOD, the best Orion I've seen to date, similar to a great renaissance painting. I totally agree with Antoine Vergara. Great picture of M31 but the Orion on APOD is something to be admired wholeheartedly. Congratulations and thanks!! Your M31 photo is the only one I've seen (not that I'm a pro) that shows the stellar-like core. The stellar-like core is very remarkable to me when observing M31 visually, and I've never seen it in the usual photographs of M31, nor seen it mentioned. I think I've heard that it is caused by stars close in to the black hole. Your work is like rare and precious art and you are truly a Da Vinci! I was examining today's APOD when I decided to trek through Deep Sky Colors collection. Your astrophotos are the very best I have ever seen. My name is Claudio Voarino, and I am the Manager of "Astronomy And Electronics Centre". We are the Australian And New Zealand Sole Dealers for Takahashi. We have been in Business for about 25 years! I would like to ask your permission to put some of your great Deep-Sky images on our website. this site is AWESOME, I love all the colors of space.